Home Line marking Back to School – with Top Mark Solutions! Top Mark Solutions went back to school recently – and on our first day at Heaton Park Primary, we got lines! Luckily for us they weren’t the kind you write 100 times on the blackboard during detention, but the kind you paint outside as school car park bay markings. 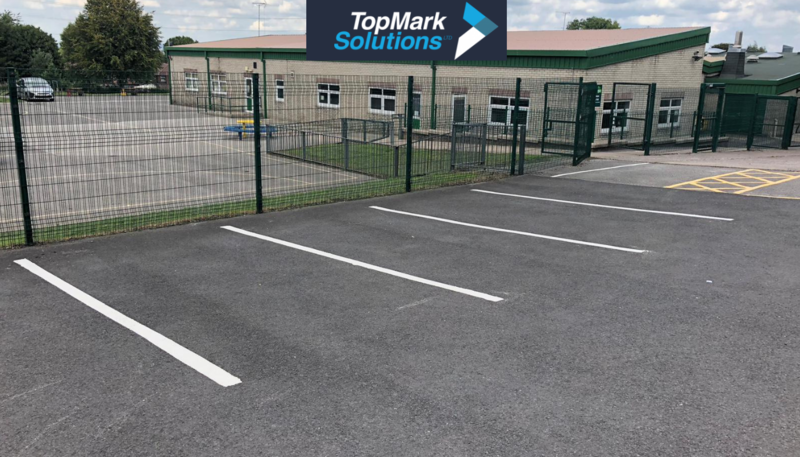 Our thermoplastic line marking team worked to give the North Manchester school car parking bays a fresh, bright new look, so it’s easy to see where to park and everybody can find a space in the mornings. As always, we worked hard to make sure we included everything the Prestwich school needed, and to maximise the available space for parking. What do school car park line markings provide? In this case we were able to mark out a good number of parking spaces, reducing the risk of people leaving too much of a gap between vehicles that can lead to that annoying ‘half a space’ left for the last person to arrive. Our car park demarcation lines were carefully planned so that even when the car park is full, cars will still be able to leave from any location within it, so nobody is boxed in at the end of a school day or open evening. Fixed width parking bays that maximise use of space with enough parking bays for everyone. Angled parking bays where the car park narrows, so it’s easier to get in and out in the tighter area. Reserved parking bays for senior members of staff and visiting dignitaries or guests. Disabled parking with extra space so visitors with mobility problems can get out of their car easily. Bright yellow hatched zones that must be kept clear at all times, including at the car park entrance. We provide thermoplastic car park line markings in familiar colours – white for parking bays, yellow for ‘keep clear’ areas and disabled bays – so visitors immediately know where they can and can’t leave their vehicle. But we can also offer a range of other school and playground line markings in all colours of thermoplastic paint, whether you need sports pitches and courts marking out, or traditional playground games like hopscotch. Our choice of vibrant colours caters for all kinds of school playground line markings, from fun to formal, and we can work quickly at a convenient time to make sure we minimise the disruption to your use of the area during the normal school day. To find out more, give us a call on 0161 976 2382 or email info@top-marksolutions.co.uk for a free site survey and no-obligation quotation.